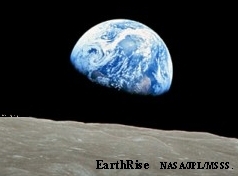 Earthrise over the Moon from Apollo 11. It is important that we keep in mind those who are heroes and villains in our efforts to protect the environment. Each year, this site takes a poll to find those most deserving of recognition in the Environmental Hall of Fame and the Environmental Hall of Shame. Nominations are now open for those awards to those who have most affected the environment by words or action. With the ongoing debate about global warming and environmental regulations, nominees should be easy to find. Please send at least one nomination for each category by e-mail through the “Contact” link or put it in the comment section . If you would, please include a short reason that your nominee should be chosen and suggest a suitable gift if they win. This entry was posted on Sunday, December 16th, 2012 at 4:34 pm	and is filed under Environmental Hall of Shame. You can follow any responses to this entry through the RSS 2.0 feed. You can leave a response, or trackback from your own site. Thank you.I was not aware that I was on Yahoo news, but I have been posting on Yahoo answers and putting links to my website when appropriate. That may have helped, or I might just be lucky.